The Response, a memorial to those who died in the Great War, situated in the grounds of the Civic Centre at Barras Bridge. Location: Barras Bridge. Materials: Bronze and Pink Granite. Status: Listed Grade II. An evocation of the 'rush to colours' in the first months of the First World War. 'Non Sibi Sed Patriae' (Not for Self but for Country). War memorials are the most numerous of all public monuments and the greatest period of memorial construction took place in the wake of the First World War. Up and down the country, committees were set up to organise the erection of memorials. Small parish councils might opt for a local monumental mason while the adminstrators of towns and cities would commission and architect or sculptor, or a combination of both, according to what and who could be afforded. There were only a limited number of memorial artists of significant rank available to undertake the enormous amount of work required. These tended to be well known figures of the older generation, many of the younger sculptors having been killed on active service. One such memorial artist was Sir William Goscombe John R.A., an example of whose work can be seen to the North of St. Thomas' Church in Barras Bridge, Newcastle. Described by Alan Borg, a former Director General of the Imperial War Museum as "one of the finest sculptural ensembles on any British monument." Goscombe John designed 'The Response 1914' as a narrative sculpture depicting soldiers marching off to war watched by an angel while women and children bid them farewell. The bronze figures are set above a rustic plinth and steps against a long granite wall on the rear of which is an isription commemorating the raising of the Northumberland Fusilier battalions by the Newcastle and Gateshead Chamber of Commerce. 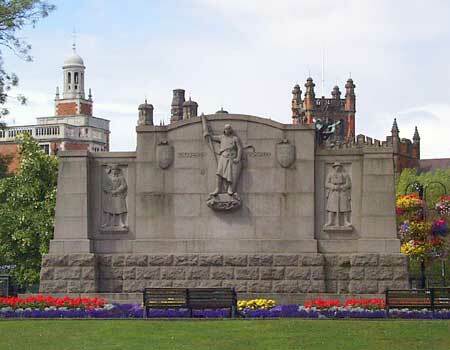 The memorial was commissioned by Sir George and Lady Renwick to commemorate three events: the raising of the Commercial Battalion of the Northumberland Fusiliers; the return of the five Renwick sons from the war; and Sir George Renwick's attainment of 50 years of commercial life on Newcastle Quayside.